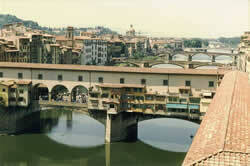 Florence, the crucible of the Renaissance, has long been considered the most precious jewel of Tuscany. Florence is a tangle of streets surrounding the orderly thoroughfares of Bruneleschi’s old city, a seductive chaos that impresses even the most seasoned travelers. A respect for the past has allowed Florence to preserve the antique character of its streets, museums, and churches; yet it rivals other great European cities in finance, food and fashion. Today its beauty remains fresh, and the bustling conglomeration of banks, merchants, craftsmen and tourists emanates an energy that is surprising given the centuries of illustrious history. This city is considered the birthplace of modern civilization. It was here that Michelangelo brought stone to life, Machiavelli redefined the political ethic and articulated the concept of a state, Dante celebrated vernacular language and defined modern Italian, and a Florentine called Amerigo Vespucci nurtured a wanderlust that would carry him to the New World. A modest wool-trading town in the Middle Ages, its innovative banking system made it possible for the city to become the unchallenged capital of painting, sculpture, architecture, medicine, astronomy, physics, commerce, and political thought. 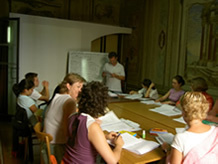 “ISTITUTO MICHELANGELO” was established to provide Italian courses in Florence for foreign students of all ages. 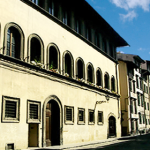 It is situated in the old sector of the city in the 15th-century Palazzo Gherardi, near the Church of St. Croce and the home of Michelangelo. The picturesque neighborhood is both residential and commercial, and has a bazaar, craft workshops and stores. In addition to the classrooms, the school also offers students a common area where Italian newspapers and magazines are always available. 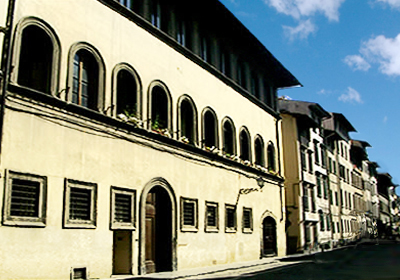 Istituto Michelangelo in Florence is equipped with a kitchen where the Cuisine courses take place. For all group courses: Minimum enrollment age: 16 years of age. Average group age: 24 years of age. Prices include registration fee, lessons as stated below, textbooks, certificate of completion and free internet access at the school. Standard Italian Course – Group 12 — 20 Italian lessons per week. 12 students maximum per class (average is 8 to 10 students per class). Schedule: 9:00 AM to 1:00 PM from Monday to Friday. All levels from Beginner to Advanced. Minimum enrollment 2 weeks. Maximum enrollment: 24 weeks. 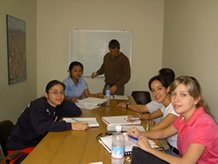 Intensive Italian Course – Group 12 — 30 Italian lessons per week. 12 students maximum per class (average is 8 to 10 students per class) during the morning, and 5 students per class maximum during the afternoon. Schedule: 9:00 AM to 1:00 PM and from 2:00 Pm to 4:00 PM from Monday to Friday. All levels from Beginner to Advanced. Minimum enrollment 2 weeks. Maximum enrollment: 24 weeks. Super Intensive Italian Course – — 30 Italian lessons per week: 20 Italian group lessons plus 10 private lessons. 12 students maximum per class (average is 8 to 10 students per class) during the morning, and one-to-one lessons during the afternoon. Schedule: 9:00 AM to 1:00 PM and from 2:00 Pm to 4:00 PM from Monday to Friday. All levels from Beginner to Advanced. Minimum enrollment 2 weeks. Maximum enrollment: 4 weeks. 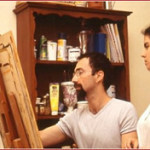 Private Italian Courses – One-to-One Italian lessons. Choose between 20 or 30 Italian lessons per week. Intensive Italian courses geared towards professionals and those students interested in making the most progress in a short period of time. All levels from Beginner to Advanced. Minimum enrollment 1 week. 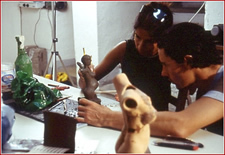 Italian Culture and Civilization — The emphasis is on Italian Language, however, the Istituto Michelangelo has a good program in Italian culture that can be taken, depending upon the dates for which the student enrolls, as either a lecture series or independent study. Subjects offered include: Italian Literature, Contemporary Italian History, and Art. 4 lessons per week. Italian cooking lessons — The Istituto Michelangelo school is equipped with a kitchen. Weekly classes in Italian cuisine are offered. Participation is optional. Prices include lunch/dinner at the end of each lesson. 2 Evenings per week. 2019 Starting dates for all Group and Private Italian Courses for ALL levels: Every MONDAY from 2 January to 16 December 2019 . Italian Teachers refresher course — Program to review Italian grammar, vocabulary, sentence structure and teaching methods. Please contact us for prices and schedules. The Senior 50+ courses are offered all year round for periods of 2, 3 or 4 weeks and are open to mature people who would like to combine an Italian language course in Florence to a rewarding first-hand experience of Italian life, culture and customs. 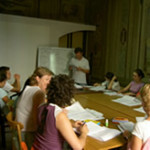 The Italian language course each the morning (4 hrs/day from 9:00 am to 1:00 PM Mon-Fri) is combined with a special senior program that includes: guided tours (once a week), day trips to other cities in Tuscany and Italy (once a week on Sunday), eating out at restaurants (once a week), cooking lessons (twice a week) and evenings at the theater and at concerts (once a week). Price includes: 20 Italian lessons per week, teaching materials, cooking classes, restaurant outings, excursions and cultural activities. It does not include accommodations, but these are available upon request (click “Accommodations” tab above for options and prices). Istituto Michelangelo offers accommodations in carefully selected and monitored host families, student apartments and studio apartments. All accommodations are located within easy reach of the school. Studio Apartment: Individual apartments for 1 or 2 people. Prices start at USD 380 per week. “A perfect match with the family. The school was all and more than I had hoped for. Definitely a life changing experience. Would love to return! Florence is a fantastic city, just as I began to feel like a resident, I had to leave!” – Phillip Stewart, Teacher.